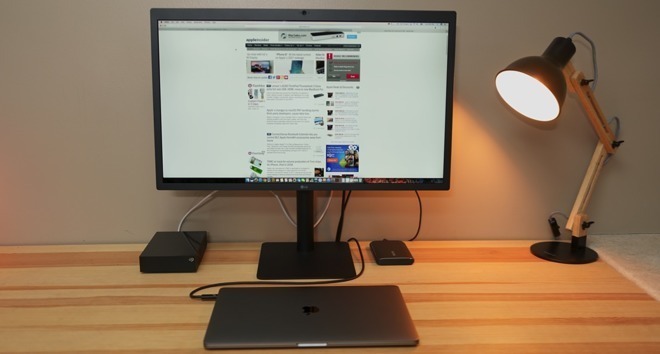 The LG UltraFine 5K display is beginning its slow march back to availability, with shipments of the improved model leaving Apple warehouses on March 7 —but some users with the monitor now are still hitting roadblocks in trying to get the situation rectified. Identifying a monitor afflicted with the problem can be problematic —AppleInsider's review unit didn't suffer from any connectivity issues when tested in a Washington D.C. suburb in close proximity to wi-fi gear. However, after transferring the monitor to a more thickly settled area in New York City, the problems cropped up even without wi-fi gear nearby. After obtaining an improved shielding plate from an early run of the improved monitors, known flawed displays retrofitted with the shielding exhibited no problems. Users with problematic units are advised to contact LG customer support for assistance. Calls made to LG today by AppleInsider still demonstrate confusion, with us having to wait on hold for nearly 45 minutes before being connected to a fifth person who finally knew what to do about the situation, and even then, we were placed on hold repeatedly to verify some procedural steps. Even after the extended period of time on the phone, the path forward for a shielding retrofit or monitor replacement isn't clear. AppleInsider will update when we hear back from LG. AppleInsider has spoken to sources within Apple's retail chain, who all have no idea when the displays will return to store stock. Unaffected displays remain exhibited at demo stations. The 5120-by-2880 DCI-P3 UltraFine 5K is currently discounted through the end of March to $974 from $1299, and was built specifically to connect to one of the 2016 MacBook Pro's Thunderbolt 3 ports. It also includes features like a trio of USB 3.1 type C ports, a webcam, and stereo speakers.